TeslaPyramids.com – Egypt's Pyramids are a series of resonant transformers harmonically balanced to the electrical condition of the Earth. The Giza Pyramids do not seem to be tombs, they instead seem more like machines, machines that generated power, real usable power. The Ancients appear to have designed the Giza Pyramids as generators which ran on the ingenious use of water hammer, the chemical and resonant catalyzed electrolysis of water, heat, and sound. The Great Pyramid also seems to be working under the same principle that Nikola Tesla’s Wardenclyffe Tower utilized, induction in the Earth. The basic idea presented here is that both Tesla and the Ancients thought up similar systems for the distribution of electricity. No one has yet been able to replicate Tesla’s Earth Wave Vibration Theory or demonstrate a working model of the Giza Pyramids as a power plant. I try to show simple similarities between Tesla’s Wardenclyffe Tower and the Pyramids without using math, and I present the idea that the Great Pyramid could function as a low-frequency acoustic engine with the passages and chambers of the Pyramid in their current empty state. The current Egyptological explanation for the building of the different chambers inside the Great Pyramid, is that the Pharoah Khufu couldn’t make up his mind about where he wanted to be buried. Khufu first wanted to be buried in the Subterranean Chamber but then he changed his mind and wanted to be buried higher up in the Pyramid, so his workers built the Queen’s Chamber. Then Khufu changed his mind again and decided he wanted to be buried even higher up in the King’s Chamber. This is the accepted explanation for why the Great Pyramid’s internal chambers are where they are and why they were built, and it doesn’t take into account that the granite of the King’s Chamber has been scorched and browned, or why the Queen’s Chamber had an inch and half of salt built up on the walls, or why the Subterranean Chamber shows signs of water erosion and cavitation. These effects can be explained by water-hammer in the Subterranean Chamber, an electrochemical process in the Queen’s Chamber, and heat being applied to the King’s Chamber. 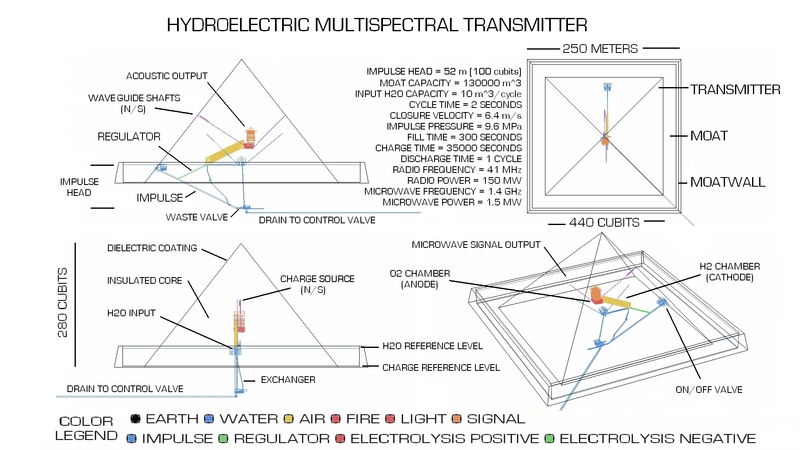 “The Hydroelectric Multispectral Transmitter.”-Doug Keenan. Below is a cross-sectional diagram of the Great Pyramid’s internal chambers and passages. Hypothetically speaking, high amplitude sound waves are generated within the Pyramid by thermoacoustic means and a monotone note is produced and sustained. The size and dimensions of the King’s Chamber, Grand Gallery, and Queen’s Chamber resonate sympathetically allowing good sustain of low-frequency oscillations. Heat is captured by the granite of the King’s Chamber while the limestone of the Pyramid is made conductive by pumping water to the top of the pyramid and allowing the water to percolate down through the stone. The white Tura limestone exterior of the Pyramid reflects the Suns light and heat helping to maintain the temperature of the Pyramid. Electricity is generated through the conversion of heat into sound and then sound into electricity, through the piezoelectric response of quartz. The Kings Chamber is playing the role of a large transducer. This is a picture of John showing his various Subterranean Chamber models. John Cadman’s Subterranean Chamber pump model requires no air in the system. The percolation shaft in the graphic above is located where there is a niche in the top NW corner of the Subterranean Chamber. The niche is in a spot where John, with inkjet testing, has shown that water would’ve flowed towards the niche. This is where water could be percolated up into the pyramid as well as relieve any air that would’ve been trapped inside the Subterranean Chamber, thus allowing the chamber to achieve the ram pump effect. With limestone being a sieve and the effect of gravity on the capillary effect of the limestone, water was likely pumped to the top of the Pyramid and allowed to percolate down through the stone. The dimensions and flatness of the Pyramids internal Chambers and Passages all appear geared towards the tuning and function of a pulsejet(thermoacoustic) style engine which generates heat and sound within the King’s Chamber and Grand Gallery, and is using the resonance and heat of the system to keep the Pyramid vibrating, catalyzing the reactions within the pyramid for the generation of more fuel. A pulsejet engine fits the pyramid power model very well. Pulsejets generate high sound pressure levels, plenty of thrust and heat, and would require no maintenance. Fire could continuously be created through the combination of fuel, oxygen, and heat, requiring no spark for combustion with very little compression. The Grand Gallery is slanted which would help with the directing of heat and the mixing of gases. Hydrogen being light would travel from the bottom to the top of the room, and oxygen, being heavier, would fall from the top to the bottom of the room. Below is a picture copied directly from http://Gizapower.com in which Chris Dunn is pointing out scorch marks on the ceiling of the Grand Gallery after the gallery was cleaned. These scorch marks could be evidence of combustion or pressures generating a standing wave and leaving a pattern showing the nodes and anti-nodes of the frequency generated. Besides driving a piston, the Cadman Pump appears to also be working like a speaker, vibrating the pyramid from below, while also vibrating the Grand Gallery along its axis. The King’s Chamber is working like a microphone, harnessing the vibrations of the Pyramid and the oscillating gases within the Chambers. Both the Cadman Pump and Thermoacoustics are beating the Kings Chamber and Pyramid into resonance, inside and out. The Grand Gallery displays signs of heat stress, like an old tandoor oven after years and years of use. Other researchers claim an explosion happened within the Pyramid pushing the walls of the Grand Gallery out over an inch, while the same type of damage found in the Grand Gallery can come from repeated detonations. Eventually the Pyramid would’ve been spent and the engine would then loose efficiency. The pyramid sites around Egypt appear to have been built for redundancy of the power system. As one set of Pyramids are failing, another set of Pyramids are already built, allowing the pyramid power system to keep running. A metal plate was supposedly retrieved from one of the Kings Chamber Vents. This plate could’ve closed under positive pressure, pressurizing the Kings Chamber and Grand Gallery for combustion. Then post combustion it could’ve opened to allow air to be drawn down into the Pyramid. If the plate was present in the shafts then the Pyramids ignition would work like that of a two-stroke diesel engine. I’ve crawled around inside the Great Pyramid with a private group for over 2 hours, and while the entire tour I was with was in the King’s Chamber, I had the Grand Gallery all to myself. This gave me the opportunity to create a bang on the floor to make the walls of the Grand Gallery vibrate. I jumped from the 4th step up above the landing where the stairs meet above the Queen’s Chamber Passage entrance, and landed on the roughly 6′ x 3′ floor boards. After the initial impact with the floor the walls shook like the sound of a subwoofer. This showed me the Chamber resonated freely. The blocks that make up the walls actually vibrated for a few seconds past me making the bang on the floor. It was unbelievable, it was like striking a nicely tuned drum. My friends on the tour came yelling asking what happened as everyone felt a shockwave roar past them. I felt assured that the Pyramid has a low fundamental frequency. The size, geometries and the materials used in the Great Pyramid are all geared towards low-frequency response. The Earth has a natural negative charge and the Ionosphere has a natural positive charge. The Pyramid builders seemingly exploited this difference of potential for electrolysis production by building the pyramid, and Kings Chamber Vents, high in the air to draw in the natural positive charge. Think of the Queens Chamber as a negative electrode with salt build-up on it. The positive electrode in this case would be the Kings Chamber. Hydrogen would be generated at the Queen’s Chamber and Oxygen would be generated at the Kings Chamber. This was brought to my attention by Doug Keenan. With the Queen’s Chamber in direct connection to the Grand Gallery, the resonance in air would be directed into the Queen’s Chamber through the water that filled the Queens Chamber Passage. The frequencies would be refracted by the water into the Passage and pick up speed on their way into the Queens Chamber. For example, if the Grand Gallery was resonating at 100 Hertz then the Queen’s Chamber would resonate around 4 times faster, or 400 Hertz, but only if water is present in the Queen’s Chamber Passage as sound travels faster through water. With the full spectrum of frequencies generated by the pyramid, its likely microwaves played a role in the generation and ignition of the gases. The Great pyramid also resembles a basic thermionic device similar to a vacuum tube. The King’s Chamber is made entirely of granite and the walls of this chamber are barely in contact with the limestone of the Pyramid. A thermionic effect could be possible by heating the granite of the King’s Chamber and effectively negatively charging the granite. Granite can withstand higher temperatures when dry, so if the King’s Chamber was kept dry than the temperature of the stone could be made hot enough to emit electrons. The Quartz in the granite is an exceptional piezoelectric material and it could potentially generate megawatts of power through the heat and pressures of the system. Through the ingenious use of water hammer, thermionics, thermoacoustics and piezoelectrics, it starts to sound possible that the Giza Pyramids generated enormous amounts of power. Note: Electricity in a wire behaves like a gas. In the Graphic above Tesla shows his analogy and realization of his Wireless Transmission Theory. The analogy is a hand pump pumping up a sphere and gauges responding all around the sphere. He states in his Analogy Graphic that each pulse of the pump is felt with equal force at all points of the sphere and that sphere could be a flexible, spherical envelope filled with a liquid or gas. Tesla then demonstrates in the Realization Graphic how the Earth could be used as a means for the distribution of electricity without wires utilizing the principle displayed in the Analogy Graphic. There’s no “free energy” in this system. Tesla makes no mention of using the energy of the Earth to power the Wardenclyffe Tower. The Tower required a large generating station which was right beside the Tower. Tesla also wanted power from Niagara Falls, which wasn’t too far away. Tesla’s Wardenclyffe tower contained two resonating Tesla Coils placed in series with Earth and a virtual ground terminating the circuit at the top of the Tower. The Tower was in a single phase configuration (single wire, mono phase) and a generating station provided the current for the Tower to transmit. Each Pyramid, Khafre and Khufu, are acting as a resonant conductor like a pair of Tesla Coils arranged in parallel configuration. With the two largest Pyramids at Giza working as resonant generators, and both Pyramids fundamental frequencies being induced into the ground in such close proximity, the fundamental frequencies of the Pyramids likely clashed in a constructive and destructive manner. The frequencies generated would mix and create a beat frequency, or pulsation. The Pyramids seem to be pulsing electromagnetic frequencies into the Earth, just the way Tesla simply describes in his Analogy Graphic –Tesla’s Earth Wave Vibration Theory. This arrangement could possibly set up a standing electromagnetic wave within the Earth, and possibly the Ionosphere, for the transfer of wireless power! The waveform above demonstrates how the Ancients could have used beat-frequencies to generate low-frequencies. Couple this effect with hitting a resonant frequency of Earth and you have a resonant switched, resonant amplified signal being transmitted around the globe. At the speed of sound through the Pyramids, using P-waves(6km/s), Khufu’s pyramid clocks in at around 26Hz, and Khafre’s Pyramid in at around 28hz. This leaves a difference of 2Hz, which a 2Hz modulation produces a 1Hz wave. The 4th harmonic of this beating frequency would be around 16Hz, this is how I arrived at the 8hz frequency above. What’s interesting about the 2Hz pulsation is that it may line up with how the Great Pyramid’s dimensions actually reflect the Pyramid moving through space twice every second, like a big pendulum. Earth rotates at 465.1 metres per second. The Great Pyramid is argued to be between 230 and 232 metres, which 465.1/2 is 232.5. The Pyramids appear to be in tune with Earth’s rotation. Below is a picture by Doug Keenan illustrating the electromagnetic resonant frequencies of the Giza Pyramids based on the latest Russian research. Take the speed of light and divide it by the Base width of a pyramid and you’ll get the electromagnetic resonant frequency of that pyramid. Khufu’s Pyramid clocks in at 230m(or 1.304mhz), and Khafres is at 215m(or 1.395mhz). Therefore, the Pyramids should modulate at 91khz, producing a 45.5khz wave. Tesla originally attempted this pulsation mechanically at 5khz pulses of a 230-250khz waveform. The pyramids appear to be in the same low frequency range in radio terms. The Pyramids actually appear to be mixing two mhz signals, modulating at roughly 91khz, which half of 91khz is 45.5khz, Eerily similar to Tesla’s own method of using a high-frequency pulsated at a lower frequency. Whether the output through the ground is electric or just low frequency sound, or both, the pyramids appear to modulate their amplitudes into a pulsation. The Pyramids produce sub-wavelengths at the speed of sound, and low frequencies in the electromagnetic spectrum. Both frequency ranges travel far and wide and possibly resonated with the planet with ease. Maybe the Pyramids are just using the Earth as a big transducer. Vibrating the Earth at an optimum frequency could yield electric phenomena like Earthquake Lights in a coordinated fashion. A standing wave formed in the Earth may give rise to surface charges at the anti-nodal points formed by the wave inference, with nodal points being places of no vibration, having no electrical effect in those spots.. The Picture below was taken in a book of Tesla Patents from a Tesla Museum in Hungary. What’s depicted in Figure 4 doesn’t appear in any other Tesla patent on the internet, and is what would appear to be, a double tower version of the Wardenclyffe Tower. The arrangement is similar to the arrangement of the Pyramids, with two resonant transformers of a slightly different frequency paired together. Notice the length of the vertical coils, the one on the left is longer and would resonate at a lower frequency than the one on the right, just like the Khufu and Khafre Pyramids. Tesla originally wanted to build two towers at Wardenclyffe, but financing prevented Tesla from building his original vision. The details on how the twin tower system would work are still a mystery, though modulation may be the answer. The Pharaohs name Sneferu translates into double-harmony. Sneferu also built two Pyramids of different size in close proximity to each other, the Red Pyramid and Bent Pyramid. This lends to the Idea that the system employed by the Ancients used mainly two frequencies harmonizing with the Earth. The Red and Bent Pyramid are located in Dashur about 8 miles south of the Giza Pyramids. Why would the Ancients build their structures so similarly? If the Pyramids were resonators then the frequencies they generate would combine into the sum of the difference of the frequencies, resulting in beats. By volume, the Pyramids Khufu and Khafre are similar to the Red and Bent Pyramids. Khafre being 85.5% the volume of Khufu, and The Bent Pyramid being 84.2% the volume of the Red Pyramid. These percentages may even be closer, Khufu’s Pyramid is argued by some Egyptologist as being a little bigger than 230m per side. The tip of a Pyramid is the perfect shape to facilitate electrical discharges of static in and out of a virtual ground. If the tips of the Pyramids were gold, that would reinforce the similarities with the Wardenclyffe Tower. Gold is a great conductor and doesn’t corrode, therefore it would remain a steady ground. The Pyramid shape naturally wicks current into the atmosphere out the tip, and with the Pyramids negatively charged and the ionosphere positively charged, we have the proper configuration for electron flow. The geometry, resonance and current of the Pyramids could yield some very interesting effects through the feedback between the structures and the Earth. The Pyramids could be oriented in a way that promotes feedback of the tones generated to further bring out the notes. If you place a subwoofer on the floor of a room and turn it up, you can walk around the room and find the spot where the sub frequencies are loudest, this is where the Khafre pyramid could be located in relation to the Great Pyramid, and where the Bent Pyramid could be located in relation to the Red Pyramid. The Giza Pyramids, and the rest of the Pyramids in Egypt, are on Earths magnetic equator. Therefore the Pyramids are 90 degrees out of phase with Earths magnetic field. This could be how some “free energy” was pulled from the Earth. Tesla was aware of this possibility but never got to prove it. The Wardenclyffe Tower was only 10 degrees North of the Pyramids. The pyramids generate sub-frequencies at the speed of sound, and low-frequencies in the electromagnetic spectrum. Both frequencies travel great distances and must’ve had an impact on the surrounding area, and maybe the entire planet. Acoustic and electric pressures in the ground could have had many uses, for example, a mechanoluminescent process. One of the interesting effects of quartz crystals is that they can emit light through an effect known as piezoluminescense. Maybe the Ancients had a piezoluminescent lighting system, essentially using rocks as lights. There are tunnels in Egypt kilometres long without any torch marks, so how did the Ancients see in the dark? There’s possibly a connection between piezoluminescense and piezoelectricity. Any monuments or temples built from stone containing quartz could very well have emitted light in ancient times. Seeing as so many ancient temples are built in geometric proportion to one another, maybe these geometries reflect the harmonic intervals of the piezoluminescent effect of the stones used in construction. We seek out temples for enlightenment, maybe in ancient times that was literally what people went to temples for, to have light shed upon them. In the image below a drill bit is being pressed into a piece of quartz crystal and light is being emitted when the drill bit squeaks on the stone. This effect can arise in the kHz to mhz range, with brightness attributed to power. Watch the videos in the links below. Doug Keenan, an American electronics engineer, has reverse engineered the Pyramid as a radio-telescope. His website’s, http://cyclesofthepyramids.com and http://bigskymap.dougkeenan.com, are incredible and he’s the first to properly reverse engineer the Great Pyramid. I firmly believe in a system like the one Doug presents on his website but I think the Pyramids might’ve continuously operated providing a continuous output through the Earth. It’s been proven that loud rock music affects plant growth. It’s also been proven that electrical stimulus encourages plant growth. The Pyramids could’ve been built to allow plants to grow bigger and faster by energizing the ground with loud low-frequency pulses of current. So if the Pyramids aren’t Tesla-like power plants than they’re very likely for the cultivation of food. That is the only other practical reason for building the Pyramids. The Land of the Dead could be where dead bodies were shipped to decompose, thus raising the EC of the water and land. Plants grow many times faster with abundant food sources. As for the “blocked Passages” inside the Great Pyramid. I say go to Egypt and see for yourself, climb around inside the Great Pyramid and talk to the locals. The locals say the Great Pyramid is as it was in Ancient times and that the Kings Chamber was never hermetically sealed. The granite block that used to sit next to the Coffer could’ve come from an excavation of the floor, and if a block was removed to gain access to the Kings Chamber, there’d be evidence of it happening. No tool marks or cracking from explosives are found where the block was supposed to be sealing the Chamber. The passages inside the Pyramid are narrow and long, a real pain to work in and excavate granite stones from let alone crawl through. I’m a musician and sound technician, I also do gas work, fire alarm tech, and commercial kitchen installations. I’m sort of Jack of all trades and I feel my experiences have enabled me to bring forward this simple Pyramid concept. I hope you enjoyed what you’ve read. I’m working on testing as you’re reading this. If you have anything to add, just post a comment and I’ll get back to you as soon as possible. This site’s still in the works, so check back later. There’s still so much more to show everyone! I can’t wait, cheers! No aliens, no religion, no magic, and no Khufu. Pyramids focus their energy down the middle. The word pyramid can be translated as, “fire in the middle.” The name for the great pyramid, Ahket Khufu, can be translated as, “Khufu’s mountain of light.” The name for obelisk can be translated as, “to the beat of a drum.” Maybe pyramids around the world are capable of harnessing an effect that we just haven’t realized yet. Maybe it’s piezolumenesence, or a earthquake/tsunami warning system, or an ancient form of communication. Whatever it ends up being, it’ll be a real, verifiable effect of some sort. For now, pyramids remain temples and tombs, but possibly not for long. Cheers.